From the "Overview Tab" of your Admin Dashboard, expand the "Engagement Tab" and select the "Supporters" section. 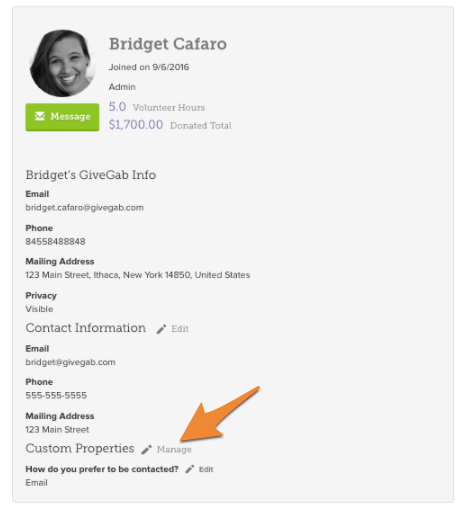 From the "Supporters" section, click on the name of the donor who you'd like to add a property for to access their supporter profile through the Engage CRM. From their supporter profile, click "Manage" next to Custom Properties to add additional options. Name: what you'd like the custom property to say on your supporter's profile.. Type: Here you can choose how the information will be entered. String, is a response in plain text. Number is a number. Boolean is a true or false response. Date is a specific date field. Once you've created your property information click "Save" to be able to update your supporter's profile with the new property field!